A Skywatcher Explorer 130 PDS 130mm, f/5 Newtonian was mounted on a Celestron AVX mount. A QHY 5L-II-M camera was placed at the Newtonian focus. 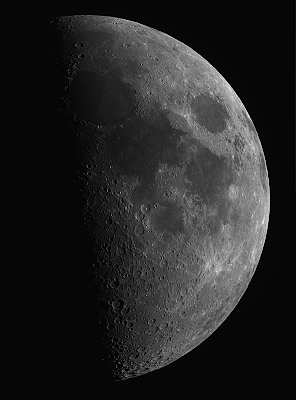 AstroDMx Capture for Linux was used to capture two overlapping 2500 frame SER files of the 50.7% waxing Moon. Autostakkert! 3 running in Wine was used to stack the best 40% of the frames of each SER file and the resulting files were wavelet processed in Registax 5.1 also running in Wine. The two images were stitched in Microsoft ICE running in Wine and The final image was processed in the Gimp 2.10. Click on the image and click again to get a closer view.